(VIDEOS) Cheesy Movie Time! The Royal Romance Of Charles And Diana and Another Really, REALLY Bad Movie About the Couple. Here are two incredible cheesy movies from 1983 about the royal romance between The Prince of Wales and Lady Diana Spencer. The first movie, The Royal Romance of Charles and Diana, stars Ms. Catherine Oxenberg and some other guy. It’s so bad, that it’s good. The second movie, Charles and Diana: A Royal Love Story, stars two people I never heard of before and whose careers have basically died after they starred in this bad made-for-TV movie. (VIDEO) Princess Anne: A Royal Romance. Here is the 1973 documentary entitled, Princess Anne: A Royal Romance. (VIDEOS) Their Majesties King Philippe and Queen Mathilde of Belgium Visit Kasteel Heeze. On the evening of Wednesday, November 30, 2016, Their Majesties King Philippe and Queen Mathilde of Belgium visited Kasteel Heeze in the Netherlands. The royal couple were welcomed to the 17th century castle by its current owner, Baron Tuyll van Serookerken, the Mayor of Heeze-Leende, Mr. Paul Verhoeven, and various Dutch government officials. Prior to their visit to Kasteel Heeze Their Majesties visited the High Tech Campus in Eindhoven where they participated in a symposium as well as workshops which focused on the “…future of the Dutch and Belgian media…” according to Dutch newspaper, Eindhovens Dagblad. 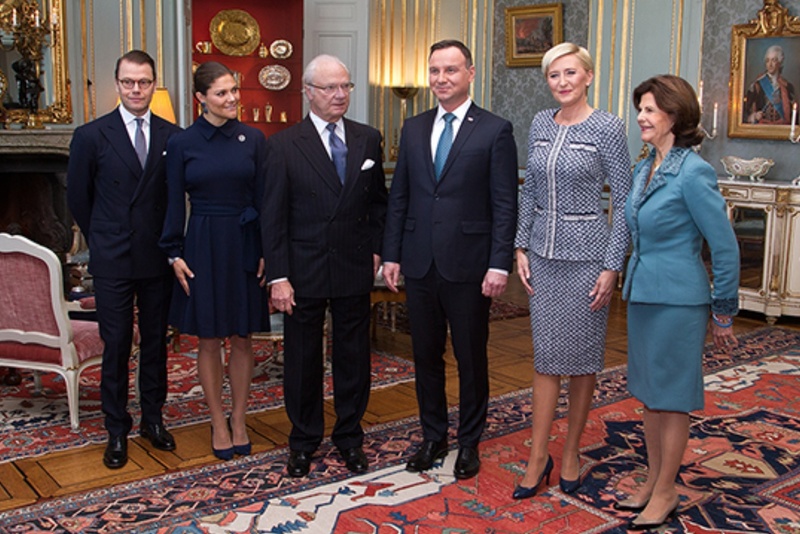 TMs King Carl XVI Gustaf and Queen Silvia of Sweden Host a Luncheon in Honor of the President of Poland. On the afternoon of Wednesday, November 30, 2016, Their Majesties King Carl XVI Gustaf and Queen Silvia of Sweden accompanied by Their Royal Highnesses Crown Princess Victoria and Prince Daniel of Sweden hosted a luncheon in honor of the President of Poland, Mr. Andrzej Duda and his wife, Mrs. Agata Kornhauser-Duda, visit to Stockholm, Sweden. Photo courtesy of the Swedish royal court. (VIDEOS) His Royal Highness The Duke of Cambridge Visits Derby. On November 30, 2016, His Royal Highness The Duke of Cambridge carried out several engagements in Derby, England. This morning the duke visited the Rolls Royce factory where he toured the Rolls Royce XWB engine assembly line and technology center. The duke also visited the Bombardier Transportation UK Limited and the Padley Development Centre. For more information about today’s visit to Derby as well as to view photos please click the links below. Article w/Photo Gallery, Article w/VIDEO and Photo Gallery, Article w/Photo Gallery, Another Article w/another Photo Gallery, Photos Galore! (VIDEO) TIMs Emperor Akihito and Empress Michiko of Japan Welcome the President of Singapore to Tokyo. On the morning of Wednesday, November 30, 2016, Their Imperial Majesties Emperor Akihito and Empress Michiko of Japan accompanied by Their Imperial Highnesses Crown Prince Naruhito and Crown Princess Masako of Japan welcomed the President of Singapore, Mr. Tony Tan Keng Yam and his wife Ms. Mary Chee Bee Kiang, to the Imperial Palace in Tokyo, Japan. (VIDEOS) Her Majesty Queen Mathilde and Queen Maxima of the Netherlands Tour Utrecht’s New Central Train Station. On the morning of Wednesday, November 30, 2016, Her Majesty Queen Mathilde of Belgium and Her Majesty Queen Maxima of the Netherlands toured the new central train station in Utrecht. Thereafter, Her Majesty Queen Mathilde visited the “…High Tech Campus Eindhoven and Sligro Food Group in Veghel, for the opening of ZiN, an ‘inspiration lab’ for the food service industry…” according to RVD. (VIDEO) TMs King Philippe and Queen Mathilde of Belgium Host a Concert at the Muziekgebouw aan ’t IJ. On the evening of Tuesday, November 29, 2016, Their Majesties King Philippe and Queen Mathilde of Belgium hosted a concert at the Muziekgebouw aan ’t IJ in Amsterdam, Netherlands. Attending this evening’s concert, with performances by the National Orchestra of Belgium and Mr. Ozark Henry, included Their Majesties King Willem-Alexander and Queen Maxima of the Netherlands, Her Royal Highness Princess Beatrix of the Netherlands, Their Royal Highnesses Prince Constantijn and Princess Laurentien of the Netherlands, Her Royal Highness Princess Margriet of the Netherlands and her husband, Professor Pieter van Vollenhoven as well as dozens of Belgian and Dutch government officials. (VIDEO) HSH Princess Stephanie of Monaco Attends an Unveiling at the Musée Océanographique. On Monday, November 28, 2016, Her Serene Highness Princess Stephanie of Monaco accompanied by her youngest daughter, Miss Camille Gottlieb, attended the unveiling of quilts in remembrance of those who lost their battle against AIDS. The event took place at the Musée Océanographique de Monaco in Monaco-ville.